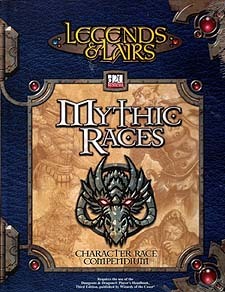 Mythic Races is the essential d20 System resource for new character races and prestige classes. This beautifully illustrated sourcebook presents more than two dozen fully detailed and original races. Entries include inforamtion on physical description, personality, religion, relations with other races, unique racial traits, a racial prestige class, and much more. Whether you're a player of DM, Mythic Races offers a wide range of challenging new possibilites for your campaign, from the familiar to the exotic to the downright bizarre.